Thankfulness is something we talk about a lot at Thanksgiving. But it’s not just a holiday concept. “Give thanks in all things.” Some might recognize that from the Bible. Now that’s a steep direction. And I don’t know about you, but one that may not necessarily come naturally. I mean it’s easy to be grateful for those days that are easy, laid back, and fun. It is easy to give thanks when the kids are happy, smiling, and compliant. And I feel overcome with thankfulness when our whole family is together, and everyone is enjoying each other. But what about the other times in life? Growing an attitude of gratitude takes practice. And if you desire to grow a family that possesses that attitude of gratitude, it may very well start with you. Are you up for the challenge? 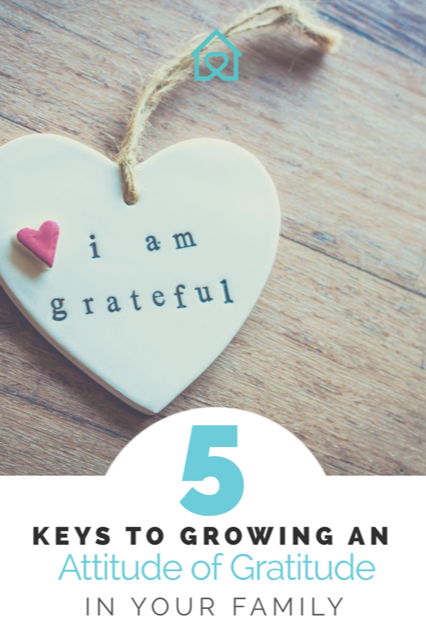 Let’s discover five keys to growing this attitude of gratitude in your family. What about those times when three kids are crying at once, dinner timers loudly scream for my attention, and the husband calls to say he’ll be home late. Is giving thanks on the tip of my tongue? What about those times when the teens are trying me to the very edge of my sanity over chores, the littles are struggling to get along and needing a steady stream or redirection, and I can’t even remember the last quiet moment I had to pursue a hobby. Do I feel a solid sense of gratitude? I’m guessing if you are anything like me, those times are trying and difficult and may yield an emotion unlike gratitude. So how do we direct our families down this course? Train your family to find the good. It can be easy to notice what is not working well or what is undesirable. Truly though, it doesn’t take any longer to see the things that ARE working well or things that are good. It is simply a matter of perspective. Find it hard to see those things? Then make a list of them and post it where you can see it and be easily reminded. A poster board full of blessings or good things would not be hard to make. It could even be a family project. Being grateful and thankful helps us see and appreciate what is there instead of what isn’t Click To Tweet. Two things that often hinder an attitude of gratitude are arguing and complaining. And those things can easily become a habit. Having a buzz word or simple phrase your family can use when you catch each other airing a string of complaints or stuck in the arguing cycle can be a quick way to redirect. It might be as simple as, “Oooops! Do I hear something?” or “What does the Bible say? Stay away …(and our children finish… “from arguing and complaining.” Or “Oooops! 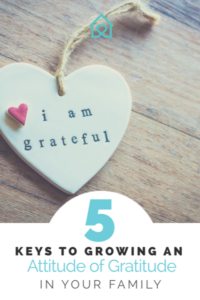 Let’s give thanks…(and our children finish… “in all things.”) These are some quick and easy ways to help redirect when we start getting off course. And children often just need a kind little reminder rather than embarrassed by a strong correction. Choose to be purposeful in expressing gratitude. We teach the niceties early in life, with the pleases and thank you’s. But we are not always as purposeful with teaching the grateful thoughts or sentiments beyond that. One way we can teach this in our families is to actively express such gratitude in our home. We may voice this to our spouse or children, encourage it between siblings, or offer it to extended family, friends, and those we meet as we are out and about. We may thank our child for words of encouragement after a tough day. We may thank our spouse for showing understanding when we came across grumpy or unhappy. We may write a note to show our appreciation to a grandparent when they are feeling a little down. We may tell a grocery store clerk how grateful we are for their happy demeanor even though they are busy or tired. These opportunities are all around us. Unfortunately, we often leave it unsaid or just abbreviate the thought with a quick, “Thanks” and then move on. But there truly is value in speaking the whole thought. Need more practice? Make it a game and role play some examples with your children. It might be that your family is not exactly on course with this attitude of gratitude. Don’t worry. It’s not too late. In fact, staying on course can mean taking inventory of where you are often and fine tuning your approach as you go. You might decide to use Thanksgiving as your springboard. Have a special family meeting to incorporate some of the above ideas or brainstorm some creative ways to bring this to life with your family. You may decide to start some new traditions with the excitement of Thanksgiving and decide how to carry this gratitude throughout the year. 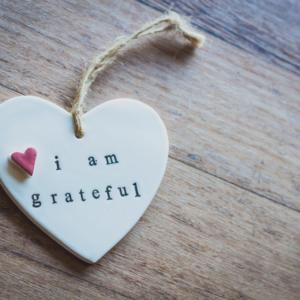 You might choose some very practical ways to make this attitude of gratitude a new family habit. I will include a list of ideas at the following link, where you can get access to a whole bunch of free resources. 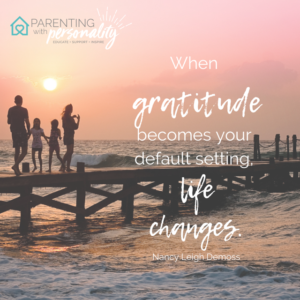 This can be one of the most challenging parts of developing an attitude of gratitude in your family. As parents, and especially moms, who are often the parent who spends the most time at home or with the children, we set the tone. Whether we are optimistic or pessimistic affects the way we speak, respond, and think. Likewise, being geared toward gratitude and thankfulness brings a whole different thought process, tone of voice, and reaction. We may train our children with our words to do something, however our actions speak much louder. They learn far more from our example than any other thing. Take a personal inventory. As you head into this coming week with Thanksgiving celebrations, I encourage you to take time to reflect on all you have to be thankful for. 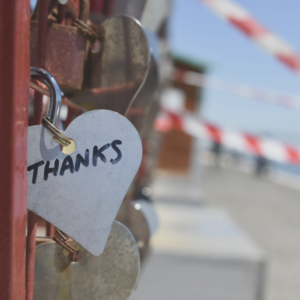 How can you actively express your gratitude? How can you set the tone? 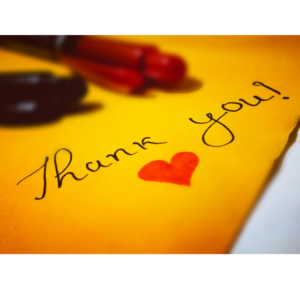 In what ways can you encourage your children to be more expressive with their gratitude? Maybe it is a challenge for you to direct your thoughts toward gratitude. Perhaps stress clouds your perspective or circumstances distract you from seeing things that are good. It is often noted that it takes doing something for 21 days for it to become a habit. Let’s see if we can’t get ourselves headed in a new direction. The included graphic includes 21 days of prompt ideas to get you thinking about what you are grateful for. There are no limits to being thankful! Sometimes we need a little jump start. So I am including in my newsletter this handy infographic to get you going on this path toward making a habit of the attitude of gratitude! How can this coming year be different than years of the past? Isn’t it exciting to think that you can change your course for the year ahead?! And even more exciting…changing your legacy…the course of your family for years to come…generations of gratitude!